Close your eyes, and imagine the sight of the blue, radiant, beautiful dolphins jumping in the air happily, and splashing back down into the majestic ocean. You may even want to ride on them! Some of the important things about these graceful swimmers are habitat, body structure, and diet. 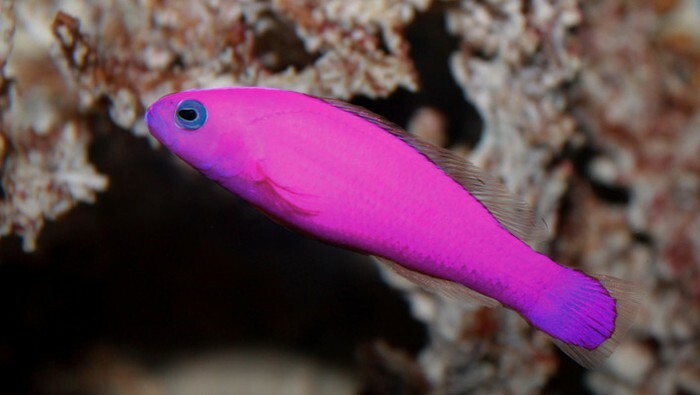 Have you ever wondered where these captivating, charming creatures live? Of course they live in all oceans and seas. Plus, dolphins can also be found in many major river systems of South America, and Asia. These marine mammals either live in fresh or salt water. A common type of dolphin called Bottlenose dolphin are distributed in temperate tropical waters. Also these powerful swimmers range from equatorial to sub polar areas. Did you know that dolphins live up to 30-40 years? Wow that’s a long time! Some of these amazing creatures are found in much smaller habitat locations like the Yangtze River dolphins, they live in freshwater, Yangtze River in China. Coastal mammals live in warm, shallow waters, while Offshore dolphins live in cooler, deeper areas. These intelligent animals are mostly found in colder water due to their need of food. Surprise to know that dolphin’s body structure, and appearance are very majestic, and brilliant. Most species are 7 to 10 ft long, however the largest dolphins reach a length of about 13 ft long. It is surprising that these magnificent mammals weight is heavier than a piano which is 1,100 lbs! You are probably wondering what special features are part of this organism. They have smooth rubbery skin. Besides that, they have 2 flippers, or fins on their sides, as well as a triangular fin on the back. These body parts help them to swim. Even though these skilled animals live in the ocean, like a fish, however dolphins are mammals not fish. Like every mammal, dolphins are warm-blooded, while fish are cold-blooded. Unlike fish who breathe through gills, but these creatures breathe air using lungs. Dolphins and Porpoises have the same characteristics however, that doesn’t mean that they look alike. Dolphins have a bear-like snout, on the other hand porpoises have a short, blunt snout. The teeth of the bear-like snout creature are cone-shaped, while porpoises are flatter. Now you are probably wanting to know what are the colors on the dolphins. They are usually colored in some mixture of black, white, and gray. Have you ever heard of Spinner dolphins? If you don’t, these mammals spin while jumping. Pretty cool right? You’ll be shocked to learn that Spinner dolphins can complete 7 spins in the air before hitting the water! Have you ever thought about what these attractive, elegant animals munch on, and how it obtain its food? 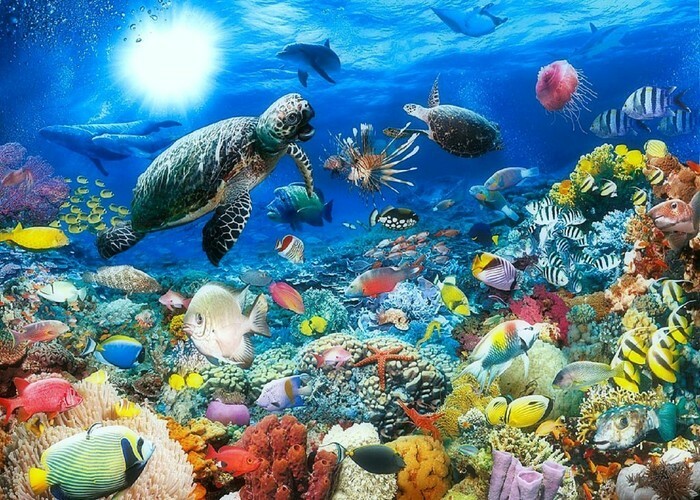 Most of the diet of these carnivorous creatures consists a variety of smaller fish, and marine life including squid, crab, prawns, and other organisms. Besides that, Coastal dolphins eat fishes and bottom- dwelling invertebrates. 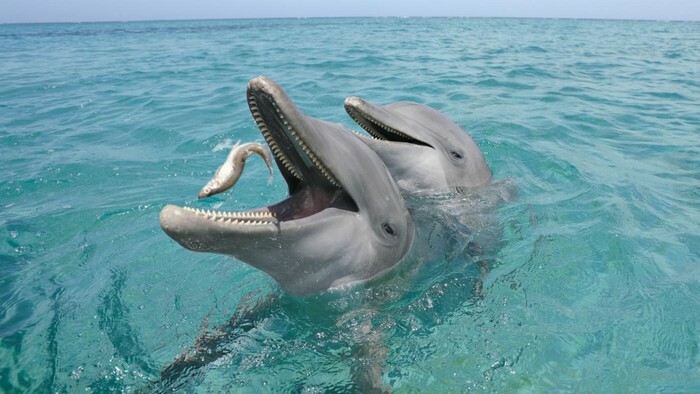 Dolphins use their teeth to grab their prey, however they do not chew on their food. These brilliant mammals locate their food by using communication, and detection system the form of underwater sonar that consists of high pitched whistles, and squeaks. Usually they have an intricate communication to tell other dolphins that there food in that area. Also these carnivore creatures are able to detect objects underwater by using echolocation. Echolocation is where the sounds they make are reflected off surfaces back to other dolphin’s ears. What is also interesting is that the time it takes for a reflected sound to return indicates how far away their prey is from the dolphin. Truly dolphins are fascinating to learn about. Don’t you think that these marine mammals have an appealing habitat, body structure, and diet? In fact due to their smarts, dolphins have an easy ability to respond to training from humans, so they can do spectacular performances in front of people. Without a doubt dolphins are certainly beautiful, brilliant, elegant creatures. 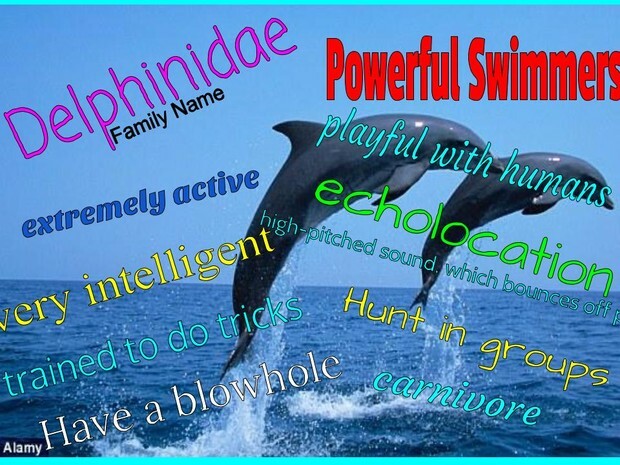 You are looking at my word wall filled with descriptions about dolphins. 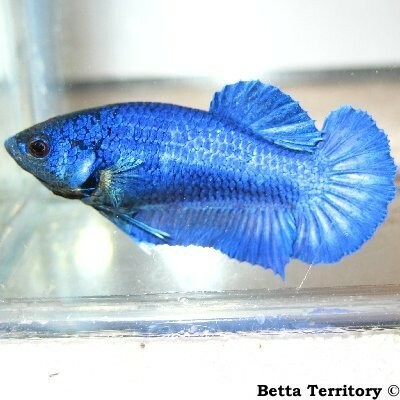 beautiful, stunning fish in it. This is my diorama. #1 is a dolphin #2 jellyfish #3 shark #4 seahorse #5 is coral #6 is a crab #7 is a sea turtle #8 is a clown fish #9 is a star fish. 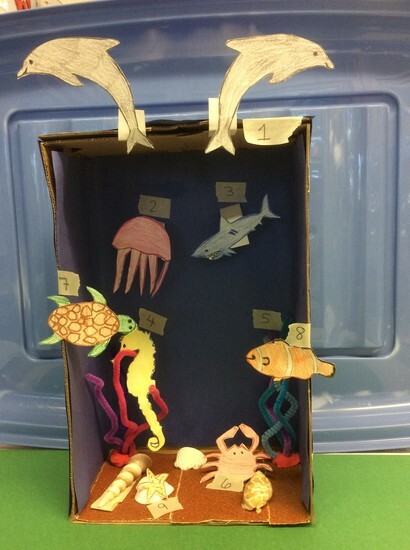 I used pipe cleaners, construction paper, sea shells, and sand paper. In this video you will be seeing dolphins doing spectacular tricks. Enjoy! !